Oooh, I’d love to win this ARC. Heading over to the fundraising post right now:) Oh and FYI, someone once found my blog by searching “horrifying rollercoaster death”. Whaaa? Lindsay Currie recently posted..Almost There!!! I just downloaded If I Stay this week! Can’t wait to read it! Yes!! Thanks for the contest! 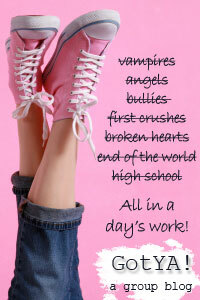 Shannan Harrington recently posted..SIGNED giveaway! I cannot wait for this book…I loved If I Stay. It was heartbreaking and wonderful and happy, all at the same time. I am dying to read this. This is the book? This is even better than just an ARC giveaway. I loved If I Stay so I can’t wait to read this! Also, I did read Maureen Johnson’s post. It’s amazing how much the YA community has chipped in so the fund-raiser can be extended. Wonderful cause. I read it, and I am thrilled so many people wanted to help. I can’t wait for Where She Went. If I Stay was awesome. And I just read Maureen Johnson’s post, and that is so inspiring. I love seeing how passionate people get about fighting for a good cause. Thanks for the giveaway! This is awesome!! And yes, I read her blog…it’s amazing what she’s raised so far!! P.S Thanks for the Giveaway! I think what Maureen is doing to raise money for those mobile shelters is fantastic. What a great idea to have boxes ready to go with all of the emergency supplies needed to help victims of natural disasters. and I’d love to win Where She Went! Yes, I’ve read Maureen Johnson’s The Last Little Shelterbox Fundraising Post! I follow her on twitter so it’s not hard to miss all these tweets. It was truly amazing what she has raised so far. It was nice to see all the people and authors coming together to donate money, however much they can give, all in the name of charity and because of that so many people would have a warm shelter. I hope 12 is a lucky number this time (and nobody is going to outspeed me while I’m writing this comment because then I’d be no.13 and that’s just not good). Oh, and of course I wisited Maureen’s site and read her amazing article. She has such a great heart, can I donate even if I’m not from US or UK? I checked it out yesterday….I think it’s incredible that she thought she’d just be able to buy one shelter, but because people are so incredible…she’s raised enough money for numerous shelters! Yay! Thanks so much for giving away your copy…I’d love to get my hands on this early! I’m also giving away an ARC of DIVERGENT if you want to check it out on my blog. I was lucky enough to win it, so I wanted to pay it forward. i <3 maureen SO MUCH for doing this. seriously. so much that i decided to mention it here. LOVE this giveaway. im dying to read this book. aleeza recently posted..Contemporary DEPRESSING! I Think Not! I looked at the article yesterday and what Maureen is doing is amazing. Just raising awareness is hard enough but getting results is even greater. I love If I Stay and I am dying to read the sequel! Count Me IN!!!! I looked at the article this morning (thanks to YAHighway) and I’m so proud of Maureen. But I’m also super proud of the people she has surrounded herself with. The ones who are rallying together to bring prizes, publicity and finally–donations to the cause. I freaking love Maureen Johnson. She’s so inspiring, and I’m shocked she raised enough money for sixteen shelter boxes. Seriously, don’t doubt the power that is MJ. Also, this book? I’ve been dying to get my hands on it since I read IF I STAY, sometime last year like September, October, whatever month it was. Seriously cannot wait for WHERE SHE WENT. Alanis Morissette! Wheeeee, she’s great. Maureen Johnson’s post IS great. I’m super impressed by the generosity of her readers. Yeah, I donated to the cause through other means (Husband is excellent about donating and we’re fortunate to be able to afford giving fairly generously to causes throughout the year). I love If I Stay, so I’m thrilled to hear you like this book even more. (I like an angsty male too.) So please sign me up. Thanks. Also, I don’t care who makes fun of me (dudes, mostly) I STILL LOVE Jagged Little Pill and often write to it (and Amy Lee’s Evanescence..which even my beloved Gilmore Girls mock ruthlessly.) But I don’t care. I love angsty, badass rocker chicks as much as I love angsty male characters. This would be great. I loved If I Stay. I checked out the post. That’s an amazing idea. I love fundraisers, which is why I run my own auctions to raise money for First Book. What an interesting post. I had no idea 950 dollars could do so much for someone. Thanks for spreading awareness. I think the last little shelterbox fundraiser is amazing! It makes me love this wonderful little world of writters and readers even more! 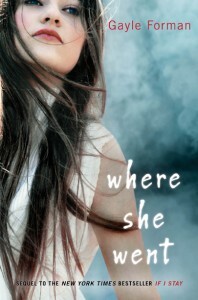 And I can’t wait to read Where She Went! I would absolutely love to win Where She Went!!!!!! AHhh, thank you so much for this giveaway! What an amazing this to do. Have you ever read 3 cups of tea? It’s incredible what your change can buy for others around the world. I’ve read the post, and I think it’s an amazing thing to do!